Fueled by the belief that "another world is possible," Fierce Light is a compelling, global journey into the world of spirit in action, an exploration of what Martin Luther King called "Love in Action," and Gandhi called "Soul Force"; what Ripper is calling "Fierce Light." 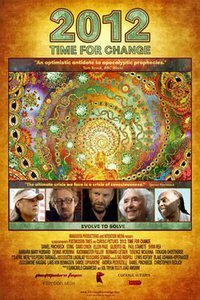 Acclaimed filmmaker Velcrow Ripper takes an insightful look at change motivated by love, featuring interviews with spiritual activists Thich Nhat Hanh, Desmond Tutu,Daryl Hannah, Julia Butterfly Hill, and more. This film really speaks to people and is a powerful testimonial to our ability to "be the change" we are looking for. This entry was posted on January 7, 2011 at 5:32 PM and has received 1167 views. There are currently 0 comments. Print this entry. I recently saw the Danish movie "What goes around" by comedian-actor-writer-director Anders Matthesen on the Spiritual Cinema DVD. 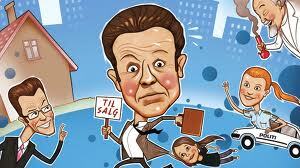 Realtor Alex Klein is having a bad day, a bad week, a bad life. He is rude to people and is the victim. Everyone - his girlfriend, daughter, boss, clients even the 14-year-old baristas who think they know the difference between highland coffee beans, picked by virgins at midnight and the coffee from the local supermarket! When Alex has a collision with another car and is in critical condition on the operating table he is enroled in a divine game show. And the prize is to win back his life. Both funny and moving Alex learns from his mistakes. And he learns to be honest with love. But who will he be if he has to give up struggle and victimhood? And what would happen if people knew that his favorite color is pink? This entry was posted on November 17, 2010 at 3:01 PM and has received 1849 views. There are currently 0 comments. Print this entry. This Wednesday Sandbox gathering we view and discuss the movie The Quantum Activist and learn about the scientific evidence for God and how you can create the reality you want. There is a revolution going on in science. A genuine paradigm shift. While mainstream science remains materialist, a substantial number of scientists are supporting and developing a paradigm based on the primacy of consciousness. Suggested donation $20 for dinner and movie. Dr. Amit Goswami, Ph.D, a pioneer of this revolutionary new perspective within science shares with us his vision of the unlimited potential of consciousness as the ground of all being, and how this revelation can actually help us to live better. The Quantum Activist (http://quantumactivist.com/)tells the story of a man who challenges us to rethink our very notions of existence and reality, with a force and scope not felt since Einstein. This film bridges the gap between God and Science. The work of Goswami, with stunning precision and without straying from the rigors of quantum mechanics, reveals the overarching unity inherent in the worlds major religions and mystical traditions. Meet the man behind the message as Dr. Goswami tells how he moved away from the religious teachings of his childhood, to seek his path in nuclear and theoretical quantum physics, and how he has come full circle, through quantum insight, back to the very religious axioms offered as a youth. With a poignant relevance to the problems of our day this film follows Dr. Goswami as he demonstrates how our mistaken views of reality have led to our current environmental, social, economic and spiritual crisis; as well as the means of correcting these errors. At stake is nothing less than our survival upon the planet. 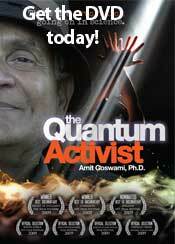 The Quantum Activist is a film for our time. It is a film for all time. It is a film whose very subject transcends time. Amit has recently appeared in the blockbuster movie "What the Bleep Do We Know? ", the award winning "The Dalai Lama Renaissance" and authored over a dozen books from textbooks on quantum mechanics to consciousness and the New Science. This entry was posted on April 28, 2010 at 2:41 PM and has received 1312 views. There are currently 0 comments. Print this entry. 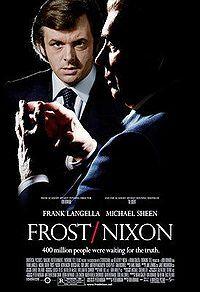 Frost/Nixon is one of my favorite movies - not just because of the drama and seeing powerful people operating up close and behind the scenes. But also for the way that David Frost successfully manifests the project under very difficult circumstances. Manifesting in the real world can be challenging - especially if other people are saying negative things about your project or get angry with you. Learn how David Frost manifested the most successful independent TV show in history (the interview with Richard Nixon) and how he dealt with lack of support from the TV networks, lack of money coming in, internal fighting in his team and pressure from Nixon staffers to gut the meat of the show. This entry was posted on April 15, 2010 at 2:05 PM and has received 1226 views. There are currently 0 comments. Print this entry. Sandboxer Millie Knox has a movie about her gender transition called Soulmates premiering at Avalon Theatre in DC on Sunday 2/21/10 8pm. As many of you know, our good friend Millie, has lived an incredible life. And just one of the incredible things about her is the many courageous things she has done to reach her own gender integrity. An experienced producer learned about Millie’s journey and chose to make a full length film. It’s called “Soulmates” and it is premiering February 21st at 8:00 pm at the Avalon Theatre NW in DC, just below Chevy Chase Circle. (5612 Connecticut Ave NW Washington, DC 20015). Gail and David Hollies saw a rough cut of the film with Millie some time ago and were was very impressed. Many indie films are almost entertaining and almost engaging. This film really delivers and it’s about someone we already know and love. David and Gail have also decided to do what we can to make the evening special for Millie. Not only is a movie about your life a nerve wracking experience, but this movie deals with some shocking twists and turns that will “out” Millie in all kinds of ways. So she may well need some friends around her. "So we’re going to have a pre-premier party for Millie at our new home in Annandale. For those who choose, it’s a chance to dress up too as we’ll invite people to embrace the Hollywood glam of it all. Also, some of us will ride to the premier in a limo I’m going to rent. We’re working with the theater to help make the arrival an event in itself. " You can buy tickets and you can buy the DVD at soulmatesmovie.com The pre-party will start Sunday Feb 21st at 4:00 at David and Gail's home in Annandale. This entry was posted on February 2, 2010 at 1:36 PM and has received 1539 views. There are currently 0 comments. Print this entry.